We had a delightful experience recently with a lovely couple, Kevin and Dawn, who were married in the Michigan Union Courtyard by Stacey Swickerath of A Simple Ceremony and celebrated in the Union’s Pendleton room. Kevin and Dawn were fun to work with from the first email exchange as it was clear that they had the right perspective on how to plan and prioritize their wedding day. Involving Ana Skidmore of Two Foot Creative and Liz Stotz of Parsonage Events enabled the couple to incorporate all of their unique ideas together into a phenomenal night. Kevin and Dawn kept the ceremony traditional in many ways including the use of classical music for the seating of guests. But when it came to the processional and recessional, they allowed their musical taste to take center stage. Our fantastic arranger, Matthew Croft, worked with Kevin and Dawn in arranging the two songs, “M79” by Vampire Weekend for the processional and “Birdhouse In Your Soul” by They Might Be Giants for the couple’s recessional. When it came time for the cocktail hour and dinner, the couple took the time in the weeks preceding the wedding to poll their guests and ask for the song titles that they would like to hear. We thought this was a fantastic idea and highlighted the couples awareness and consideration for their guests. The response was as varied and eclectic as their guest list. We played hits from the Beatles, Journey, Bruno Mars, Lady Gaga along with nostalgic songs such as La Vie en Rose, At Last and Mack the Knife. Contemporary songs were also present with Such Great Heights by Postal Service and Royals by Lorde. Parsonage Events created architecturally intriguing trees for the table centerpieces and the food served by Michigan Union Catering Service was outstanding! It was no surprise to discover at the end of the evening that Kevin has a long history with music and musicians. Kevin and Dawn are a memorable couple and it was a sincere pleasure to be a part of their wedding day. Best wishes! Freddy the Dog Joins the Wedding! We had the pleasure of playing at Cornman Farms in Dexter for Sheila and Jacob’s wedding day. This unique venue offers guests an exclusive experience on 42 acres of pastoral charm. Though there was initial concern about rain, the sky cleared enabling the ceremony to be held on the front steps of the farmhouse. Officiated by Denise Tucker of Perfect Day Celebrations, family and friends had a beautiful view of the couple from the lawn. Freddy the dog had a special seat for the ceremony which for a short time was on the train of Sheila’s gown! The bridal party walked to the Israel Kamakawiwo’ole version of Somewhere Over the Rainbow while Sheila chose the more traditional Kanon in D for her processional. Kaeli Garcia from Luna Soiree and Maiyan, coordinator at Cornman along with their wonderful staff made sure it all looked beautiful and helped us with cues. The couple recessed to the Beatles hit, “Here Comes the Sun” followed by a cocktail hour and reception in the barn. Best wishes to Jacob, Sheila and of course, Freddy. Congratulations to Edward and Melissa on their wedding at Frutig Farms in Ann Arbor. This was a family affair from start to finish as Edward is the son of Kelly and Ed, Frutig Farms owners. Barn weddings have become very popular in the last ten years. They offer clients a unique blend of history with the space for large wedding parties. The open simplicity provides clients with a blank slate for implementing their own design ideas. Recently awarded the 2016 Best Venue for Large Weddings in Ann Arbor, Frutig Farms is a beautiful outdoor venue six miles from downtown Ann Arbor. The site overlooks a gorgeous pond set against natural wetlands and rolling fields. Uniquely restored historic buildings sit amongst beautiful perennial gardens. The couple chose to have their ceremony in one of the two barns known as The Valley and Edwards’s father acted as the officiant. It must have been an honor and delight for him to lead the couple through their vows to the pronouncement of husband and wife. Barb Thayer was the coordinator and directed the day beautifully. We sat up in the loft and had an excellent view of the proceedings. The couple chose all classical music for their ceremony including the Purcell Trumpet Voluntary for Melissa’s processional. The cocktail hour and reception was held at Misty Farm, the second barn of the Frutig Farm holdings. At Melissa and Edward’s request, we played songs by Coldplay, Pharrell, Journey, Game of Thrones, Katy Perry and more. Larry Lee and Back In the Day were setting up for the reception which was sure to be a fantastic evening. We extend our thanks to the band for their help with sound and their encouraging applause. We wish we could have stayed to hear their music! Congratulations to Edward and Melissa and we thank them for the honor of being a part of their wedding day and family’s celebration. Congratulations to Susan and Joel on their wedding at Weber’s Inn in Ann Arbor. Known for its discriminating taste for comfortable elegance, the couple held their ceremony and reception in the Atrium Dining room. 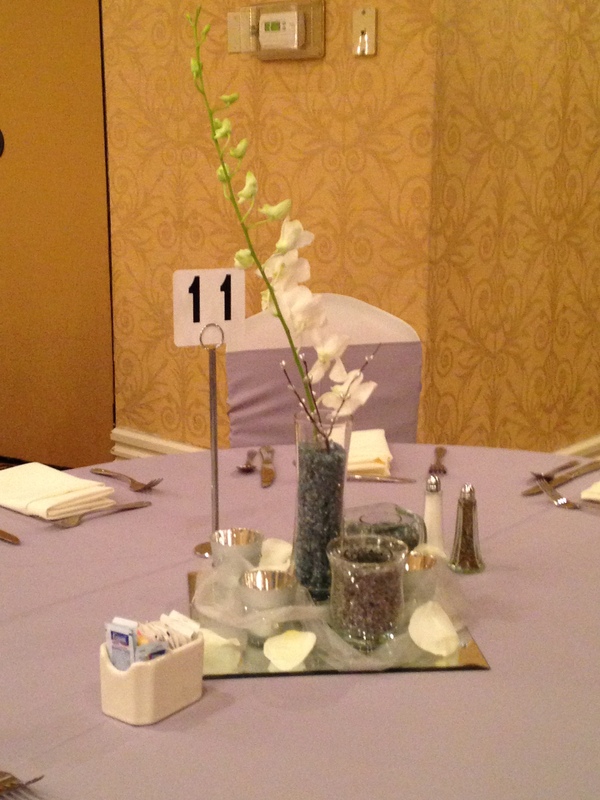 Beautiful flowers graced each table and while lush bouquets set the stage for the alter area. The family and bridal party walked down to Canon in D while Susan processed with her mother to Purcell’s Trumpet Voluntary. Pamela Swider of PS I Love You Ceremonies officiated the ceremony which included two readings and a unity candle during which we played La Vie en Rose. We’ve had the pleasure of working with Pamela before and appreciate her attention to detail. She was a great help with cues along with the superb staff of Weber’s Inn who helpful and accommodating. We understand that the couple will be enjoying a honeymoon in Hawaii and wish them the very best as they begin this new adventure together. There are dozens of Chemistry clichés that can be used to describe two people in love. They have “good chemistry” or “souls that resemble attract inevitably”. It’s safe to say that Danielle and Brad have probably heard them all! These two University of Michigan chemists were married in the perennial garden at Matthaei Botanical Gardens on a sunny day in August. Coryanna Ku officiated and Francesca, coordinator at the gardens, was a tremendous help! The couple kept it simple with traditional wedding music including Jesu, Joy of Man’s Desiring, Canon in D and Purcell’s Trumpet Voluntary. Silk Thumb Florists composed lovely arrangements that fit with the setting of the botanical gardens and Special Moments Photography was on hand to capture the moments that Brad and Danielle will want to savor for years to come. We played the Beatles song “All You Need is Love” for the recessional and it seemed so fitting for this couple who clearly share a special bond. No chemistry pun intended. Misty Farms at Frutig Farms is a beautiful outdoor venue situated just six miles from downtown Ann Arbor. Located on sixteen peaceful acres, the 2400 sq. ft. historic restored barn has room for a band, dancing, and eating. 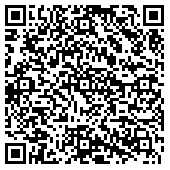 The barn accommodates up to 130 people seated, and for parties over 130, tent site is available. The site overlooks a gorgeous pond set against natural wetlands and rolling fields. Uniquely restored historic buildings sit amongst beautiful perennial gardens. Simone and Brady chose to be married by the pond on a mild October day. Though rain was in the forecast, coordinators Kelley Frutig and Barbara Thayer advised the couple to proceed. The weather held off for the ceremony allowing all to enjoy the fall foliage. Eileen Stevens of Down the Aisle Ceremonies officiated and directed a tree planning ritual for which we played Christina’s Perri’s “A Thousand Years”. The couple also commissioned an arrangement of “On Top of the World” by Imagine Dragons for their recessional. Love in Blooms Florist maintained the natural foliage theme with eucalyptus and natural grasses. For the reception, guests moved into the barn for a dinner provided by Satchels BBQ and dessert from Love and Buttercream. DJ Luke Frutig of Lufru Entertainment provided the music for dancing which was captured by videographer Blue Racer Productions. Farms and barns have historically been places where people gather and enjoy life and the bounty of the earth. What better place to experience the most special family moment and begin a lifetime of good memories. It’s always a pleasure to play at a new venue and meet new colleagues in the wedding business. Trista and Stuarts wedding at The Valley of Misty Farms provided us with both! Situated on sixteen beautiful acres just six miles west of main Street in Ann Arbor, Misty Farms is a top choice for those seeking a beautiful outdoor venue close to the heart of Ann Arbor. On site are two historical barns; one built approximately 1860 and the other after the turn of the century. Trista and Stuart chose a shady glen by the river for their ceremony. 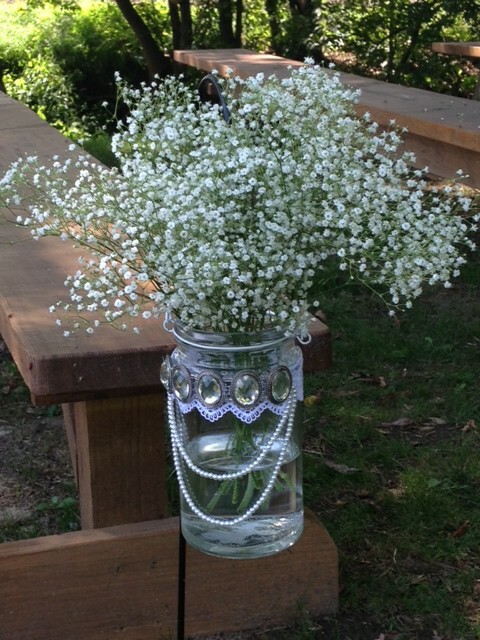 Pine benches were laid out for the guests with mason jars of baby’s breath outlining the aisle. We’ve noticed that baby breath has been very popular this summer. Trista, escorted by her mother, walked to Christina Perri’s “A Thousand Years”. Denise Tucker directed a touching ceremony which included a hand fasting ceremony complete with beautiful colorful colored ribbons and involving the couple’s young son. The cocktail hour was held in the courtyard between the two barns and began with a champagne toast. We played several movie theme medleys and contemporary songs. Our arrangement of “Game of Thrones” is always a big hit. We had the pleasure of meeting and working with April Gladieux from “Your Perfect Day” and send our thanks for her help with cues and logistics. 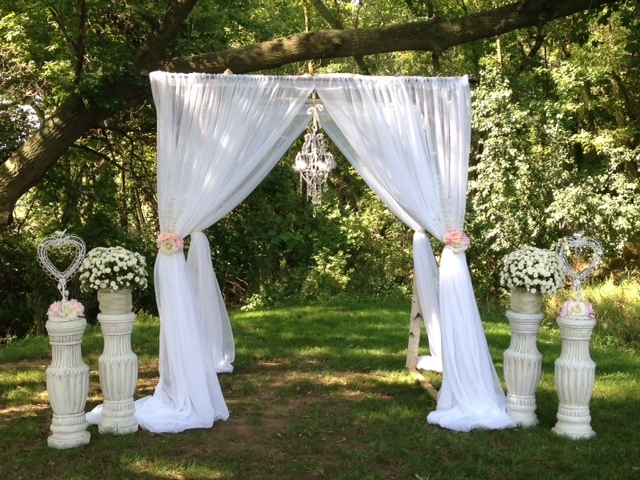 A beautiful wedding was held recently at Matthaei Botanical Gardens in Ann Arbor. We have played at this facility many times and always rave about the staff. This experience proved to be no exception. 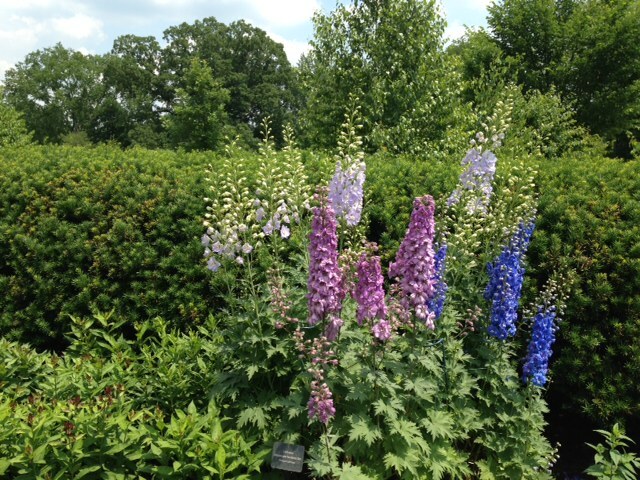 The ceremony was held in the perennial garden which of course implies a lot of sun. Since our instruments do not hold up well to direct sunlight, Linda Neely and her staff graciously provided a tent so we could play in the shade. 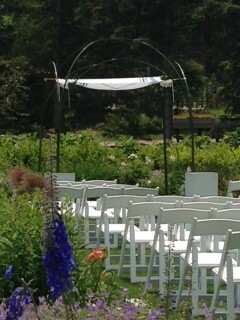 Melanie King and her staff from Two Foot Creative created a beautiful setting for the ceremony. Miriam Jerris, a friend of our quartet, directed the ceremony that united Jeremy and Sarah under the chuppah. The couple met at the University of Michigan and has been planning this wedding across time zones. 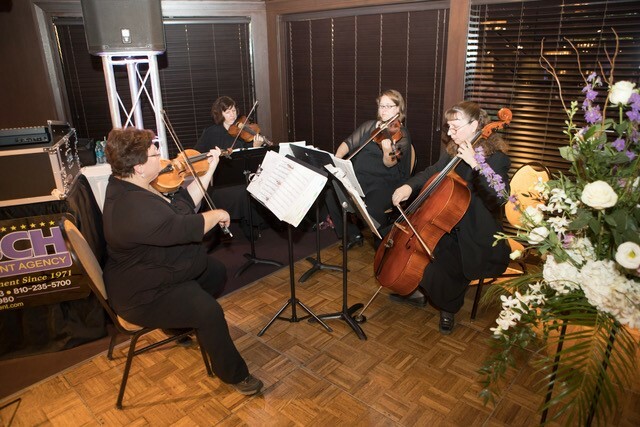 They enjoy the music of the Beatles and requested many of their hits for the seating of guests. 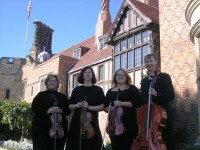 We also performed the sentimental music of “Fiddler on the Roof” including “Sabbath Prayer” and “Sunrise, Sunset”. During the ceremony, Miriam Jerris read the touching poem “These Are the Hands” and shared with guests that the beautiful ketubah was handmade by a family member! The end of the ceremony was marked by the breaking of the glass and shouts of Mazel Tov. We send Sarah and Jeremy our heartfelt congratulations!